Have you ever walked into a store and walked out with more than you had planned to purchase. 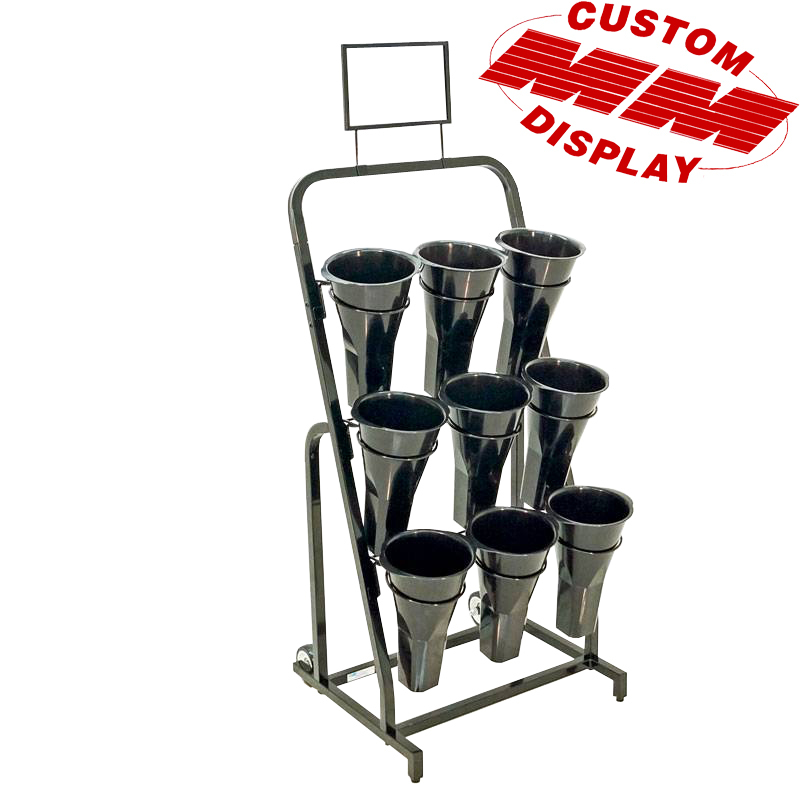 Call Mobile Merchandisers for all of your Floral Display needs as we know how to provide you with Floral Display Racks that will tempt your customers to do just that! Whether you are looking to showcase just a single vase on a free-standing pole or a flourishing “wall of flowers”, our Floral Display Racks with their tube steel frames and wire are sure to enhance not only the presentation of your bouquet but the appearance of your supermarket, floral shop or convenient store. Designed with ease of mobility in mind, allow our Floral Display Racks to greet your customers at the front door, end of an aisle or even in specific department with a plethora of color and enticing fragrances from your fresh cut or artificial flowers. Place one of our 42” 1, 2 or 3 Vase Floral Display Racks at the checkout stand. The space or real estate that this Floral Display rack takes up is very small and therefore you are able to show off some color and at the same time entice the customer to choose a last minute purchase on a fresh or artificial bouquet of flowers. These smaller racks are also ideal for smaller convenient stores, delis or gas stations as they require very little space and provide a lot of color. 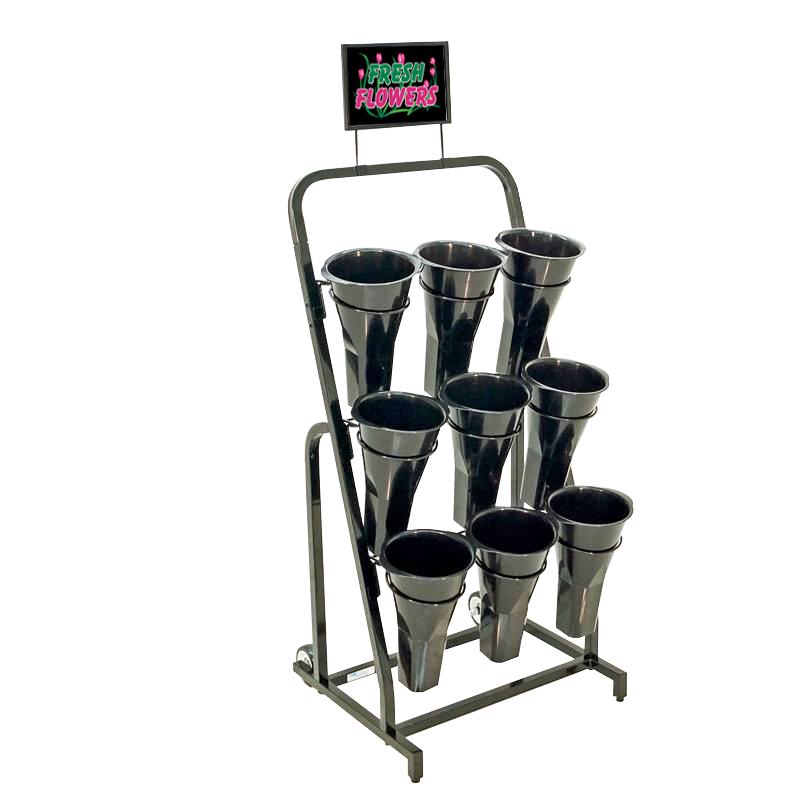 Our 48” Floral Display Racks are great for your floral department in your supermarket, floral shop and even hospitals. They will provide a wall of color with 6 or 9 vases. We also offer a 59” Floral Display Rack with 12 vases.